This section explains data gaps, opportunities for data refinement and areas for further study. We require better electronic tracking of the abundant water-related information that is collected each year, to help us monitor changing conditions and flag potential areas of concern. In addition, cumulative effects analysis requires a collaborative regional approach to help us understand impacts not only locally, but across the region. Additional observation and monitoring of wells is required to better understand water levels and seasonal variation. Aquifer testing and cumulative effects analysis requires consistent application of standards of practice to ensure quality and comparability of information. High quality monitoring data is required to refine the accuracy and certainty of water budget assessments. We lack surface flow data for some major creeks and rivers within the RDN. New hydrometric stations are required to address these information gaps in some water regions, while in other water regions, reactivation of existing discontinued gauges would provide an immediate solution and requires less work – historical data is also available. The RDN is working together to pilot an online water use tracking application, similar to the pilot project in the Okanagan – see obwb.ca/bcwurc for more information. Although an abundance of water-related information is being collected each year within the RDN, insufficient regulatory guidance and the inability of MOE/RDN to electronically track this information creates large data/knowledge gaps. This severely impedes the RDN’s ability to properly manage watersheds and aquifers in a sustainable manner. In the absence of regulatory guidance, water users and groundwater practitioners are left to develop studies that may not be consistent with other studies or may not sufficiently advance the state of knowledge in a watershed or water region. Studies are often focused on local scale issues, whereas a more regional approach may be necessary to understand the project impact and cumulative effects of numerous water users in a water region. There is a need for developing a consistent approach and consistent data requirements for all water-related studies. Monitoring of surface water and groundwater use and its corresponding effects on creek/river flows and aquifer performance will provide an early warning system to help prevent over use. It is the only way that cumulative impacts to a watershed and underlying aquifers can be accurately quantified and appropriate water resource management strategies developed. In the absence of these data, unrestricted extraction of groundwater in particular, can lead to aquifer dewatering and supply wells running low or dry without much notice. This was the case in the Cowichan Valley Regional District in the summer and early fall of 2012 when low flows and declining groundwater levels reached critical levels. Typical groundwater studies submitted for subdivision approval in BC involves a 100 day predictive calculation to accommodate for seasonal fluctuations in water levels. Although these short-term predictive assessments may be adequate for addressing seasonal variations, the approach is inadequate for planning community water supply that extend over a lifetime (100 years or more). It is imperative that cumulative effects analysis becomes standard hydrogeological practice for confirming water supply in advance of land development. Submission of groundwater monitoring and following up with submission of aquifer performance data, once a groundwater supply system becomes operational, should also be required to confirm theoretical predictions upon which the approval was granted. In the absence of regulatory guidance, there is limited opportunity to properly manage water resources within the RDN such that sustainable use can be achieved. An electronic tracking system for assigning well permit, well tag, and mapped aquifer numbers is needed. This information can provide the cross-referencing of production well logs with monitoring information needed to develop accurate water budget estimates. The system should be universally applied to all water wells but consideration should also be given to include other types of monitoring wells that are drilled for investigative purposes. These may include environmental monitoring wells, wells used for remediation, geotechnical wells, geothermal wells, etc…. The rationale is that any activity occurring in the subsurface that has the potential to affect the quality or quantity of fresh groundwater resources needs to be considered as part of water resource management planning. Waterline understands that extending the requirements beyond water supply wells would create some challenges. However; it should be noted that protection of fresh water resources for present and future residents of RDN/BC is at stake. Hydrogeologists rely on high quality well data to complete groundwater related assessments, therefore it is essential that more effort be made to elevate the quality of data collected by drillers and ultimately compiled in the MOE Wells database. This should be done in coordination/consultation with the BC Water Well Drillers Association. A system is needed that makes it easy for drillers to submit high quality well log information to MOE. Well log information should also be reviewed by a hydrogeologist prior to uploading to the BC Wells database to ensure that all information is being captured. This includes well screen interval, lithology/aquifer name, pumping test data, hand held GPS location, etc…. Although this may seem an onerous and expensive task, it would more than offset the long-term cost of installing new MOE wells or conducting countless studies to try to sort out the information at a later date. Mandatory submission of all well logs should be made a requirement. At present, provincial legislation calls for voluntary submission to MOE. This is problematic as some drillers have elected to not submit logs to MOE. In the absence of provincial legislation, a stronger stance is required by the BC Water Well Drillers Association to make on-going licensing of drillers conditional on the submission of high quality well logs. Every well drilled in an aquifer within the RDN should be treated a potential monitoring point from which conceptual hydrogeological models can be developed and sustainable groundwater management can be accomplished. The public should be made aware that groundwater is a shared resource and not owned by individual landowners, despite the fact that wells and pumping equipment may be owned by individuals. Landowners are encouraged to submit well logs to MOE or the RDN as a cross-reference or check to ensure that drillers are submitting their well logs. Drilling for resources: An observation well network expansion program in B.C. aims to provide long-term info about ground water resources. Standards of practice for conducting hydrogeological investigations are not unique to BC. Although the geology and regulatory system may differ, standard approaches to water supply investigations are well established in other jurisdictions and guidance documents have been developed which can be easily applied to aquifers in BC in the absence of formal legislation. In advance of undertaking the water budget project, MOE reviewed historical groundwater study files and undertook the re-interpretation of over 100 aquifer tests conducted within the RDN over the last 20 years or more in an effort to estimate the hydraulic parameters of mapped aquifers. This exercise provided fundamental information required by Waterline for completing preliminary water budget assessments. Such analysis should be made a requirement every time an aquifer test is conducted. Controlled aquifer testing is needed to quantitatively assess hydraulic characteristics of aquifers (transmissivity and storativity) and to fully assess the lateral extent, geometry, and aquifer boundaries. These data are essential for improving water budget calculations. There is an opportunity to collect high quality aquifer testing and groundwater monitoring information with every groundwater study or new well that is drilled and tested within the RDN. However, a clear and concise guidance document for individuals involved in aquifer testing and analysis (well owners, drillers, pump installers, and hydrogeologists) must be made available by the RDN. BC Certificate of Public Convenience Certificate Application Guideline is a useful reference. There are numerous existing documents from other jurisdictions that provide similar guidance, such as Alberta Environment’s Guide to Groundwater Authorization (updated March 2011). This document provides an excellent reference for groundwater practitioners detailing groundwater investigation and analysis approach. There is also a need for assessment of cumulative effects for all new projects being proposed within the RDN if a stable, long-term groundwater supply is required. The standard practice by groundwater practitioners has generally been to complete a well capacity rating over a 100 day period to assess if sufficient supply exists for a newly proposed development. This practice is inadequate for considering the long-term cumulative effects of groundwater extraction on individual aquifers or even areas within aquifers. As was demonstrated with the long-term climate variability assessment using the Pacific Decadal Oscillation, it is possible to slowly dewater an aquifer during long periods of pumping as the total recharge to an aquifer declines over decades. Capturing volunteer landowner water level and water quality data. Some effort has been made by Vancouver Island University in this regard by creating an on-line database. However; to date, very little data has been collected. More data is needed in highly stressed areas. The RDN plans to install data loggers in existing wells to help supplement existing water level data from MOE’s observation well network. Waterline has provided recommendations to the RDN for observation well locations based on a search of the Waterline Geodatbase constructed as part of the Water Budget Project. Significant Recharge Areas identified as part of the present study need to be further refined. Observation wells will also need to be identified in these areas as well. 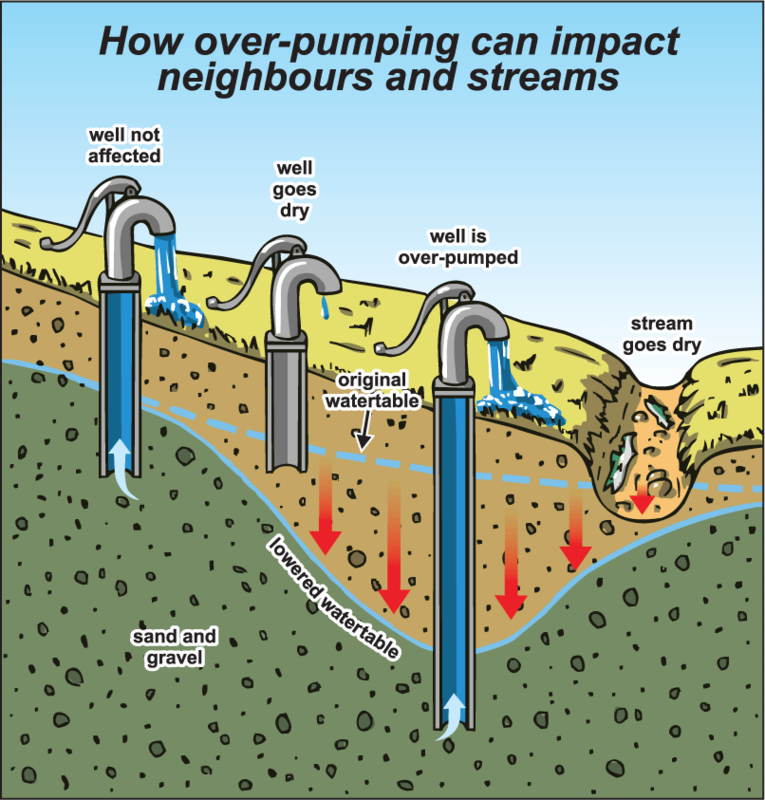 Multi-level monitoring wells will need to be installed along creek/river margins where aquifers and surface water systems are suspected to interact. Water levels in aquifers that feed base flow to rivers/creeks will need to be maintained to ensure the protection of aquatic ecosystems. Other methods may be used to better define areas of interest, including; the installation of seepage meters at the base of rivers/creeks, thermal imaging of creeks/rivers to determine areas where groundwater may be upwelling, and electrical conductivity and temperature surveys. Surface water gauging above and below a critical reach where groundwater is suspected to discharge can also be used to assess/measure groundwater interactions with rivers/creeks. 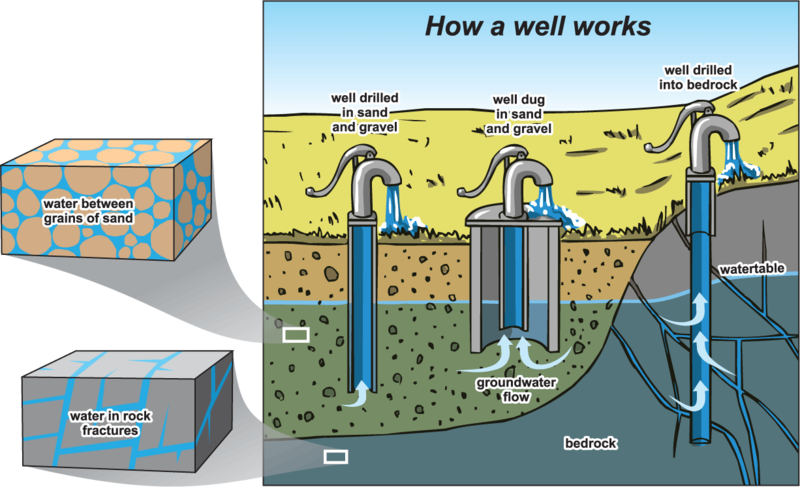 Observation wells also need to be installed in areas along the coast where salt water intrusion may be occurring or suspected to occur. Proper instrumentation including data loggers that measure changes in electrical conductivity of the groundwater will be required. Although water quality could not be addressed as part of the present study, largely due to the poor condition of the electronic data, future studies need to consider water quality assessment as it provides further confirmation on regional linkages between aquifers and surface water flow regimes. Some of the major creeks and rivers within the RDN lack surface water flow data. Although new hydrometric stations may be required, an immediate and less expensive solution would be to reactivate previously discontinued Water Survey of Canada gauges. This approach requires less work as rating curves are already established and historical data already exists. There may also be a need to install new hydrometric stations in un-gauged creeks/rivers which has already been discussed for each specific water region. The MOE/RDN need to establish an electronic tracking system to collect actual measured surface water and groundwater use information. As was shown for the Nanaimo River surface water budget assessment, using the licensed allocation values to complete the water budget calculation is misleading and may incorrectly indicate the level of stress on the river. Groundwater extraction volumes for large users also need to be tracked in a consistent manner. The RDN water service data is in a relatively good condition, however; data for large municipal users or private utilities was not always available. The Water Use Reporting Tracker web application previously developed by Vancouver Island University, or currently being developed by the Okanagan Water Basin should be considered for this purpose. Note: to learn more about the pilot project in the Okanagan, go to obwb.ca/bcwurc.